The Green Bond concept was developed in 2007/2008 by the World Bank and Skandinaviska Enskilda Banken (SEB). They created this fixed income product to respond to demand from investors who wanted to support projects that address climate change. By 2010, almost $4 billion of green bonds were being issued by a variety of institutions such as the World Bank and the European Investment Bank. 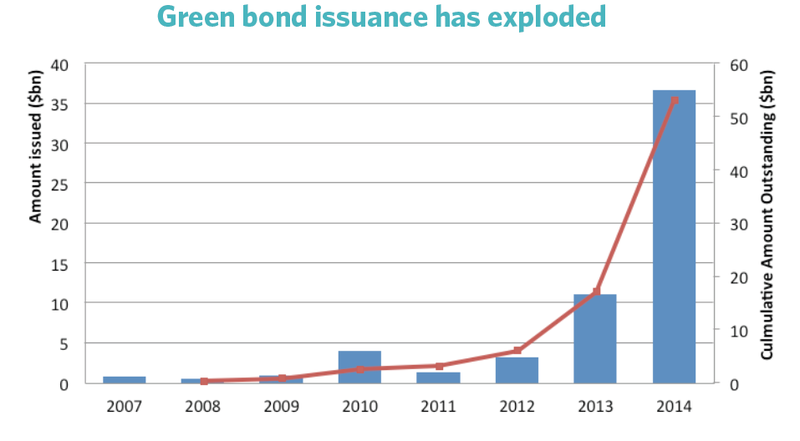 Corporate borrowers began issuing Green Bonds in 2011, followed by municipalities and local governments. Green Bond buyers may expect the entities who originate Green Bonds to have better social and sustainability behavior than entities who do not. This study tests this assumption by examining the perceived social performance of a set of Thomson Reuters-tracked Green Bond issuers, using CSRHub data on perceived social responsibility performance. We found data on the social performance for 83% of issuers on Thomson Reuters list. Together they accounted for 99% of the $951 billion cumulative face value of the Green Bonds issued by the 90 distinct entities we reviewed for this study. To see the full research report, download a complimentary copy here or below. Bahar Gidwani is CEO and Co-founder of CSRHub. He has built and run large technology-based businesses for many years. Bahar holds a CFA, worked on Wall Street with Kidder, Peabody, and with McKinsey & Co. Bahar has consulted to a number of major companies and currently serves on the board of several software and Web companies. He has an MBA from Harvard Business School and an undergraduate degree in physics and astronomy. Bahar was recently interviewed on Brian Lehrer TV. He plays bridge, races sailboats, and is based in New York City. CSRHub provides access to the world’s largest corporate social responsibility and sustainability ratings and information. It covers over 15,000 companies from 135 industries in 132 countries. By aggregating and normalizing the information from 400 data sources, CSRHub has created a broad, consistent rating system and a searchable database that links millions of rating elements back to their source. Managers, researchers and activists use CSRHub to benchmark company performance, learn how stakeholders evaluate company CSR practices, and seek ways to improve corporate sustainability performance.